Chacko Kayalaparambil Scaria obituary. Carnes Funeral Home. 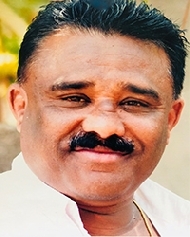 Chacko Kayalaparambil Scaria (64) passed, August 11, 2018 peacefully at residence. He was a loving husband to Rosy Chacko for 34 years. He is survived by 3 children, Richards Jacob, son who cared and took care of him lovingly. Daughters, Martina Jacob and Goldie Jacob who has always been there for him and took care of him and the love for him is and always will be unconditional. His son in law Joseph Jacob, respected and loved him as well as his daughter in law Babitha Richards. His grandson Anthony Jacob is a mirror image of him and will miss him dearly. He celebrated his life of 64 years in harmony and peace, now is the time to celebrate his memories for the family.